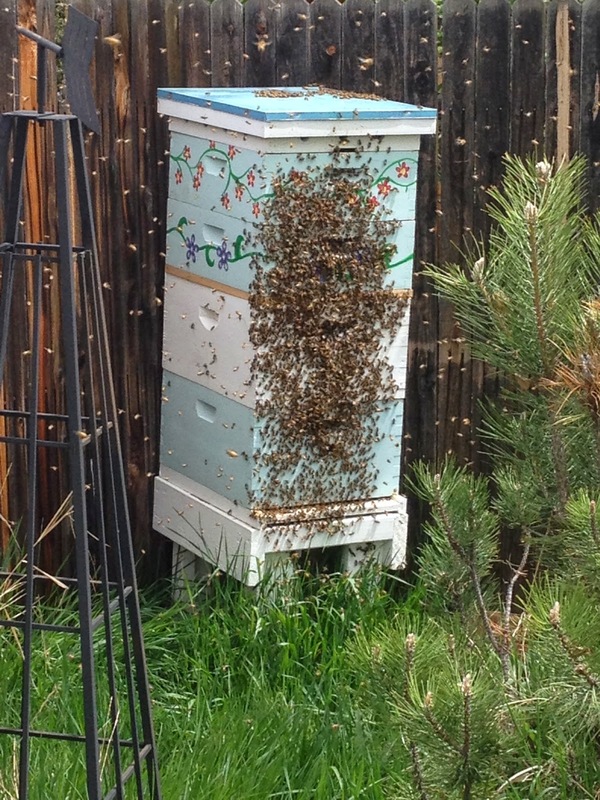 So my wife added supers today to the top of the hive -- she has them so nicely decorated, after all -- and the bees skedaddled out of there and were buzzing about somewhat madly. They often do this, but the hive is so strong this year it was pretty amazing to see. That's about half the bees that exited the hive, the rest are swarming around -- you can see them in this video, which also finishes up with my first-ever time lapse. See that black windmill in the photo? That's where I stuck my phone to do the time lapse. So what's happening? My wife thinks she disrupted some swarming behavior -- she spotted some queen larvae when she had the hive open -- so some (or all) of the bees were getting ready to leave because the hive was too hot, or too small, or otherwise unsatisfactory. Adding the boxes on top should give them room to do their thing comfortably. Interestingly, it took them about an hour to go from their "bearded" state at the beginning of the time lapse movie to get mostly inside -- you'll notice if you watch carefully, they seem to mostly make their way to the main entrance on the bottom of the hive. Interesting stuff. Want to see more interesting stuff? Read about our VW Bus Bed Build, the Treehouse Build, or the Solar Stock Tank Swimming Pool. Memorial Day: Treehouse Spring Inspection! Who Over-Wintered In Our Treehouse?